Preheat oven to 425 degrees. Brush outside of caps with dressing. 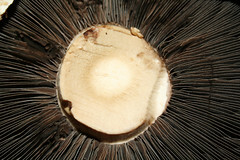 Place mushroom, gill side up, in deep dish. Place tomatoes and basil in bowl. Add garlic, cheese, and bread crumbs. Mix gently. Scoop mixture evenly into mushroom caps. Bake 16-18 minutes until mushrooms are tender.